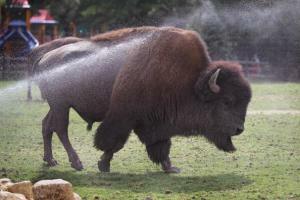 We had Janet Napolitano's deputy coyotes on State St. to run the rats out of town, but Bison will roam behind sturdy fences. This somehow seems wrong. I think we should invite the Bison downtown for a run around City Hall. Maybe let 'em loose in the Council chambers. A small detour over to the Courts. Take out a few trolls.